Atriple-lens camera setup on an iPhone could do a lot more than just add enhanced optical zoom, according to a new report. 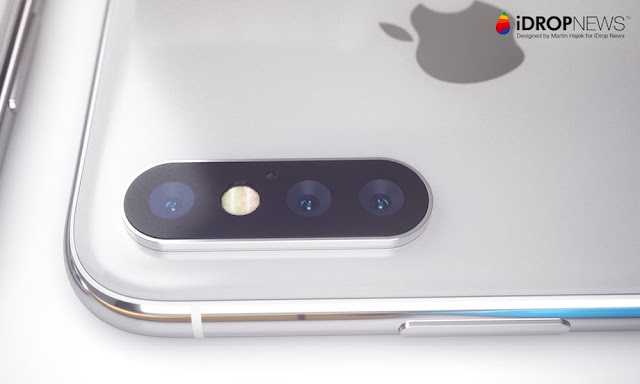 At least one iPhone in 2019 could sport a triple-lens rear camera setup, Deutsche Securities analyst Jialin Lu wrote in a research note (via Economic Daily News). Lu believes that the third lens could sport a longer focal length for better zoom capabilities. Presumably, the triple-lens setup will allow for 3x optical zoom. For comparison’s sake, the iPhone 7 Plus, 8 Plus and X all sport 2x optical zoom. But Lu added that the triple-lens system is likely to be a boon to Apple’s augmented reality platforms, too. The analyst believes that the updated system could allow the iPhone to use its various lenses for advanced 3D sensing. Basically, two camera sensors could capture simultaneous images of an object from slightly different angles. Lu added that the iPhone’s software could also use triangulation to obtain the distance between the device and the said object. In other words, Lu is forecasting that Apple will leverage the triple-lens system to enhance its augmented reality platforms — much like the TrueDepth camera does. Both systems would essentially be dual-purpose. The TrueDepth camera allows for Face ID and Animoji, while also enhancing AR experiences. And in addition to 3x optical zoom, a triple-lens platform could pave the way for similar capabilities on the rear camera. The report also lines up with previous rumors about enhanced AR systems. Back in November, Bloomberg reported that Apple was developing 3D depth-sensing technology for its rear-facing iPhone cameras. Notably, that Bloomberg report suggested that Apple could use a laser-based system to estimate distance. But Lu believes that Apple will bake a depth-sensing platform into its existing camera setup. This new report also makes perfect sense with Apple’s broader ambitions for augmented reality. Apple CEO Tim Cook has publicly revealed the company’s expanding interest in augmented reality platforms. Last June, Apple released ARKit — a developer platform allowing for augmented reality apps in iOS 11. That toolset made iOS the largest augmented reality platform basically overnight. There are also widespread rumors about an Apple standalone AR wearablecurrently in development. Back in April, the Economic Daily News reported that Apple was considering launching an iPhone with a triple-lens camera next year. In addition, analyst Jeffrey Pu of Yuanta Securities Investment Consulting also forecasted a triple-lens iPhone for 2019. Huawei just recently released what is likely the first mass-market consumer smartphone with a triple-lens system. And with Apple reportedly on board, it’s looking increasingly likely that three-lens cameras will become a new standard for flagships. On the other hand, while 2018’s lineup of iPhones is expected to sport enhanced camera capabilities, most reports have ruled out a triple-lens setup making it to an iPhone this year.